Willow Grace: "A Short Trip"
"I have a crazy question for you. What are you doing the week of February 10th? Kids are going to overnight science camp that week and husband is going to be a chaperone. So I want to do something fun! Are you around to go on a short trip?" In my head, I assumed a spa day in Sonoma or at the farthest, a 3 day roadtrip to San Diego. 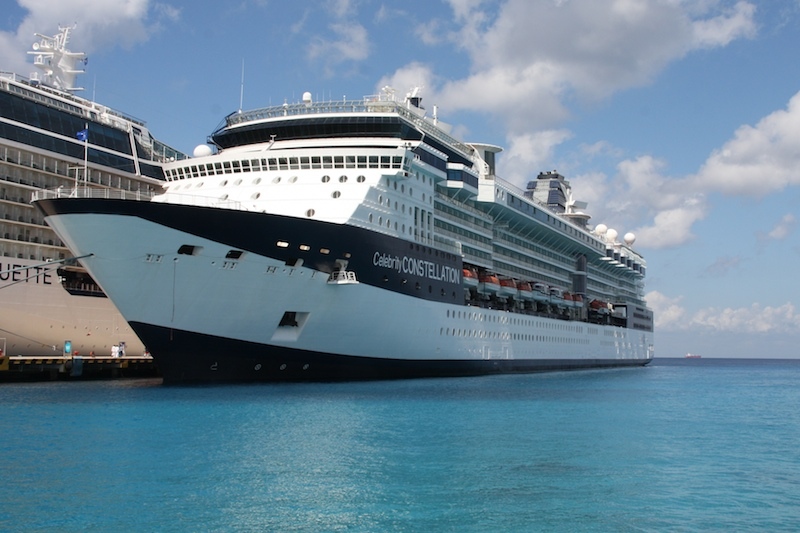 But little did I know, within 3 weeks after our initial conversation, I would find myself on a 5-day Caribbean Cruise. We left San Francisco on a rainy Friday afternoon and arrived just before midnight in very humid Fort Lauderdale. The next morning at the hotel during breakfast, we sat next to a couple who were about to go on their 56th cruise. 56! 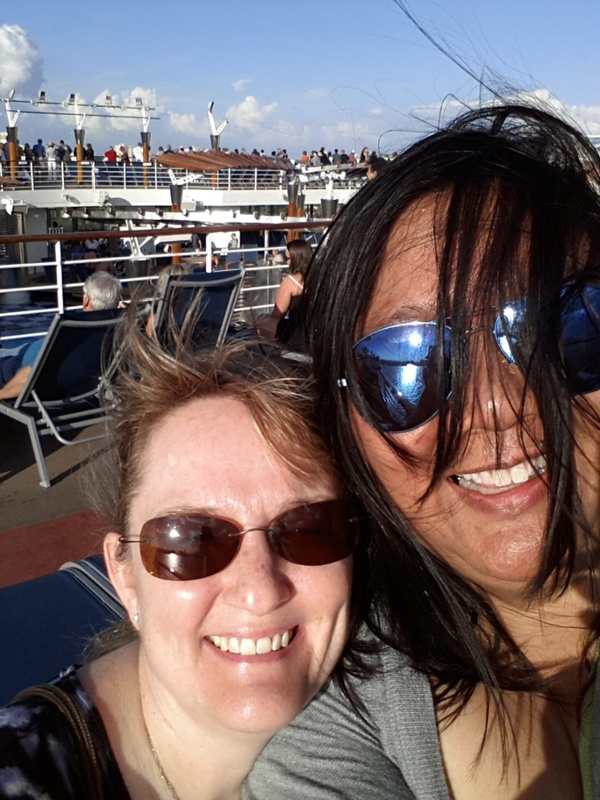 As we met people on our trip, most of them had over 15 or 20 cruises under their belts. KC (my girlfriend and travel partner) had done 6 or 7. Even though I thought I had a lot of cruising experience with 4, I was still very much a novice with this crowd. We left Fort Lauderdale around 4pm. 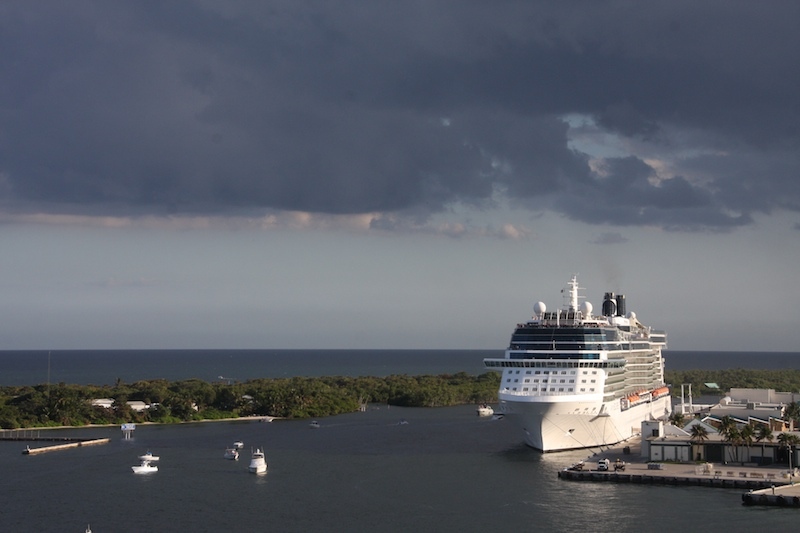 The skies looked a little bit ominous, but we had smooth seas the whole time. 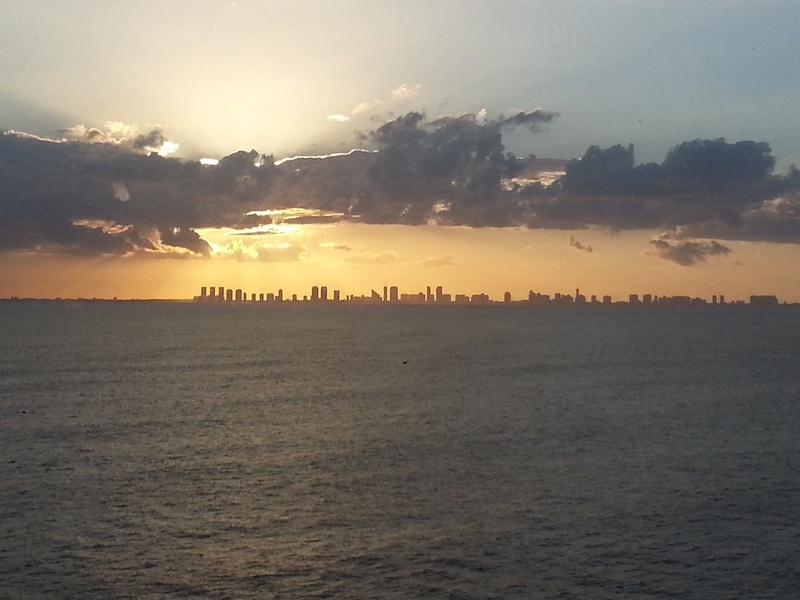 And the amazing clouds gave us this beautiful view of the sun starting to set behind Miami. We had 2 days at sea. For the most part, we spent the days lounging by the indoor pool. Neither of us are sun worshipers, so we were very happy that the ship had a smaller pool that was shaded and somewhat air-conditioned. It had a huge sunroof so it was sunny over the pool, but all the lounge chairs were in the shade. But when we weren't lounging or in the pool, we were eating. 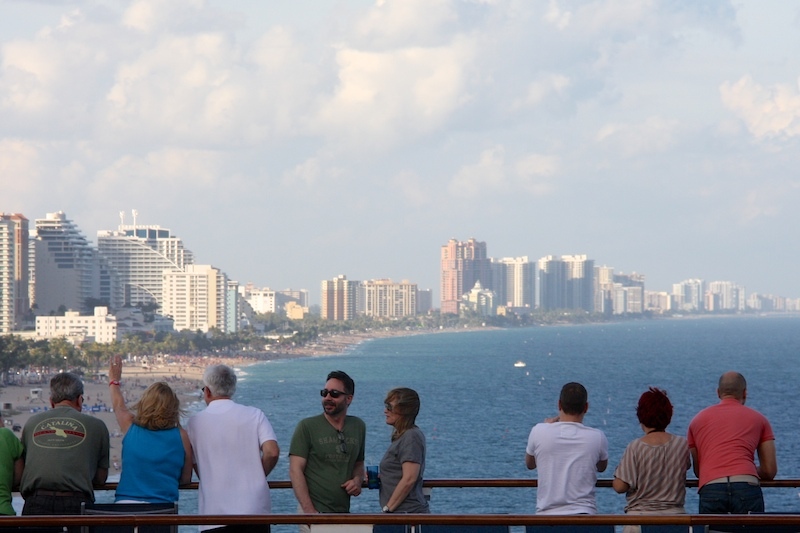 Yes, everything you've heard about cruising and food is correct. 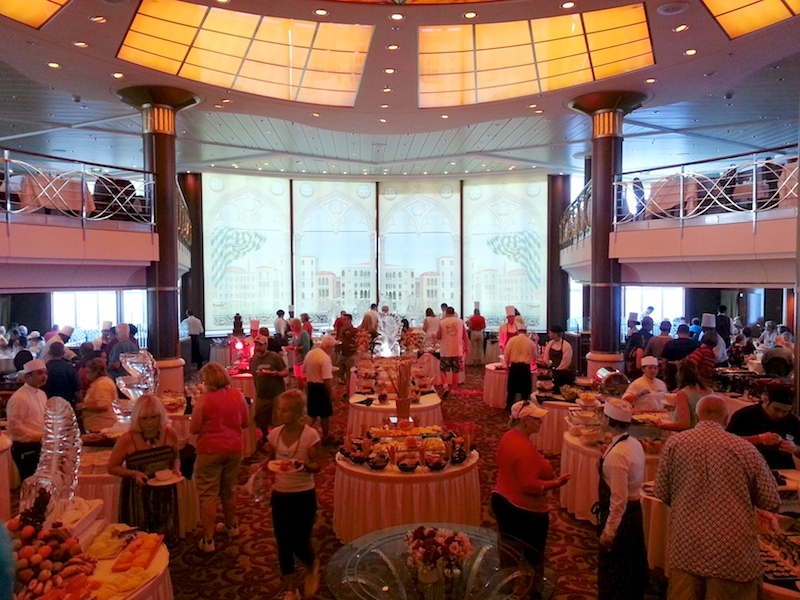 This was the Grand Buffet on our last day at sea. 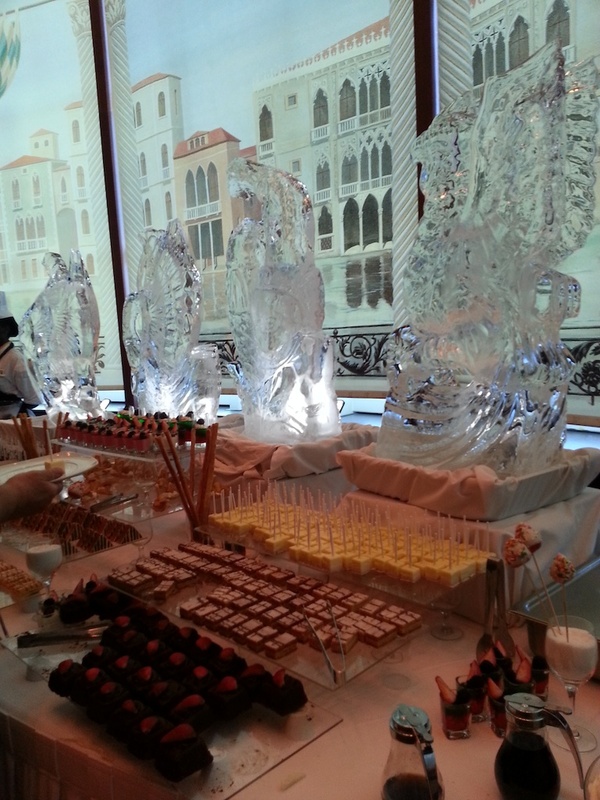 Complete with ice sculptures and every kind of food or sweet you can imagine. 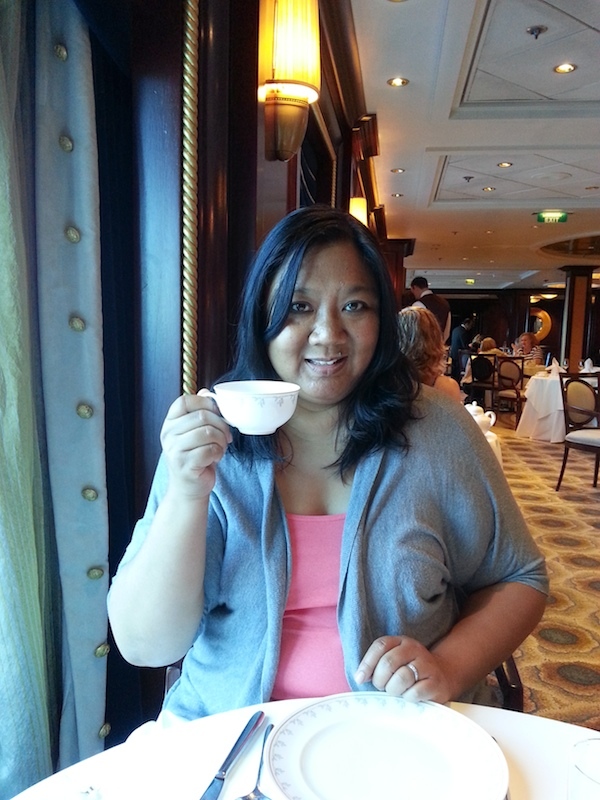 And of course we had to have a proper English High Tea. 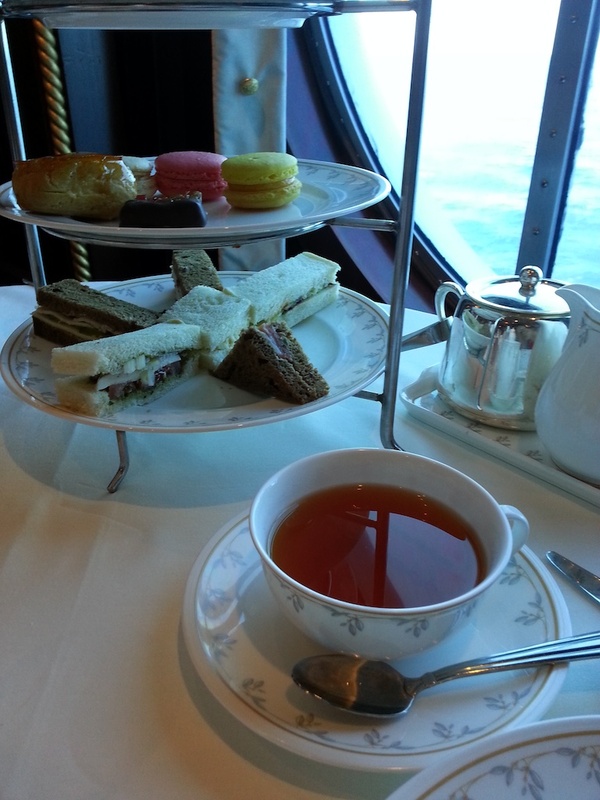 With finger sandwiches, scones with clotted cream, more sweets and as much English Grey you could drink. 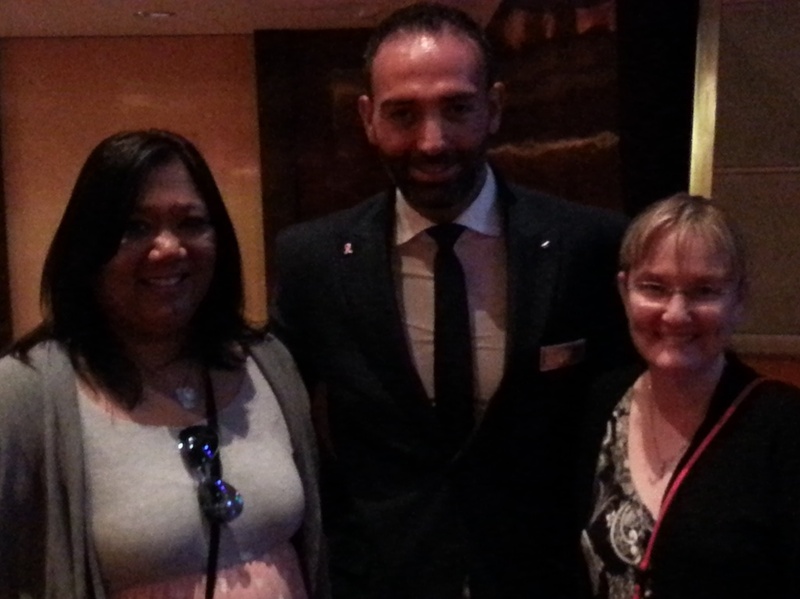 We met the captain, who was from Greece and had the best sense of humor! 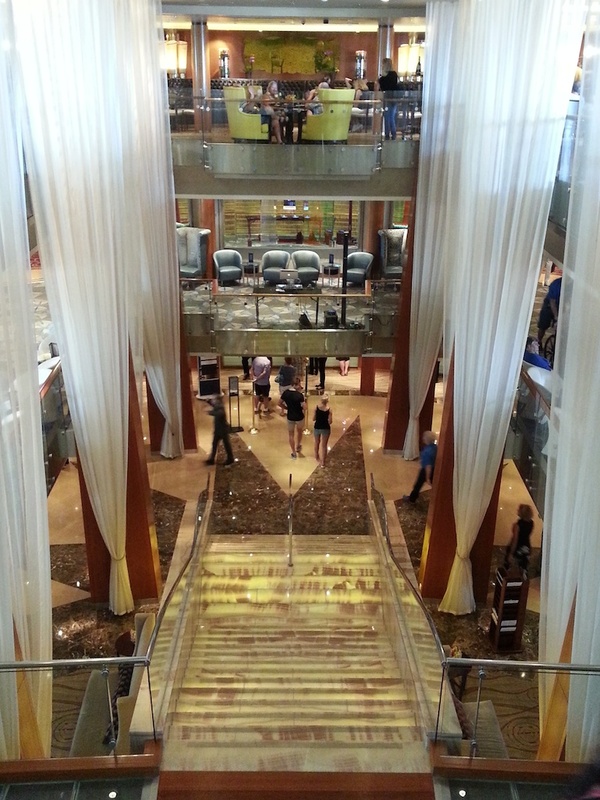 The Grand Lobby. But since we spent most of our time poolside, or eating (! ), we didn't spend much time here, though it was very pretty. 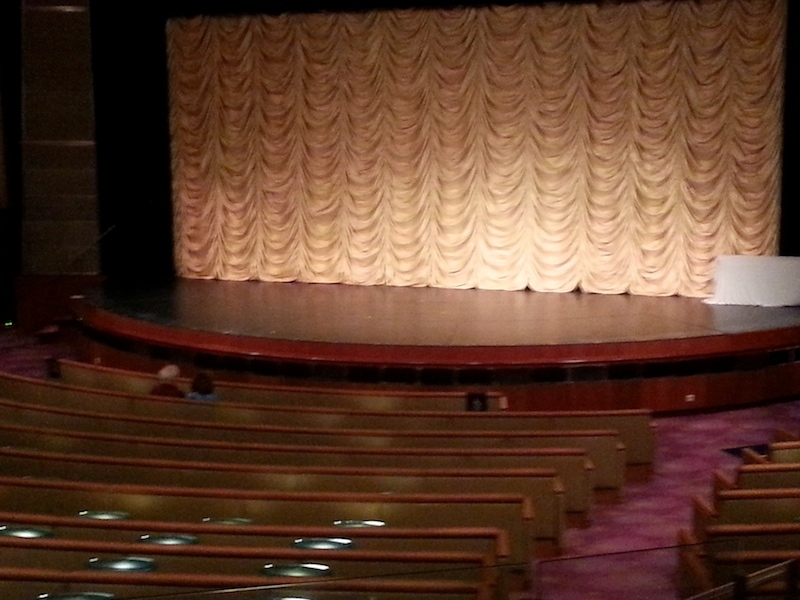 We did watch the nightly theater performance, all of which were extremely entertaining, including a comedian, a cirque-de-soliel style contortionist, a magician, a juggling act, and top rate musical and dance performances. 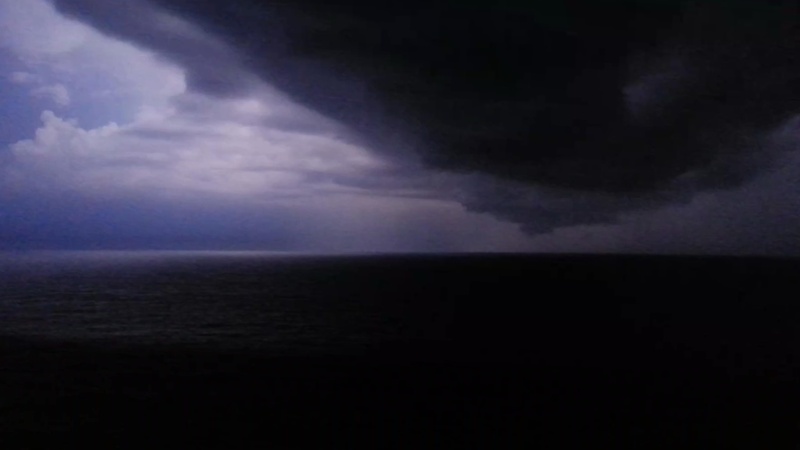 Our last night at sea, we watched an incredible lightning storm. It rained a lot, but surprisingly, the ship didn't sway much at all. 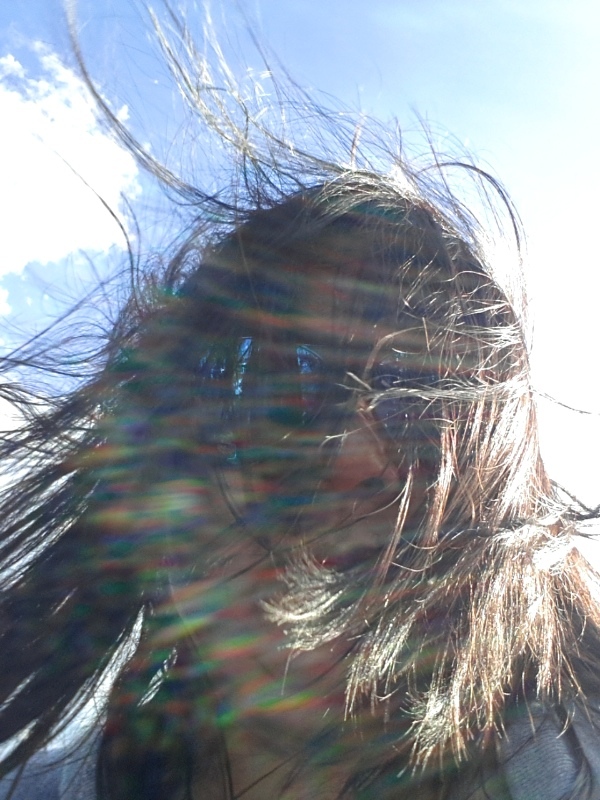 Although I'm fortunate that I don't usually get motion sick. It wasn't until I got home on solid ground that I felt a bit of vertigo. Unfortunately, a month later, I'm still feeling woozy and dizzy. I've heard it's not uncommon and can last for months after disembarkment. So that was our life on the ship. We went to Key West and Cozumel, so I'll share photos from those excursions soon. what a fun cruise! LOL on the food and i like the tea time too.